The Sport Leash helps you keep a firm grasp on your busy life. The unique hand wrap adjusts to your palm and provides a secure hold while keeping your hands free. 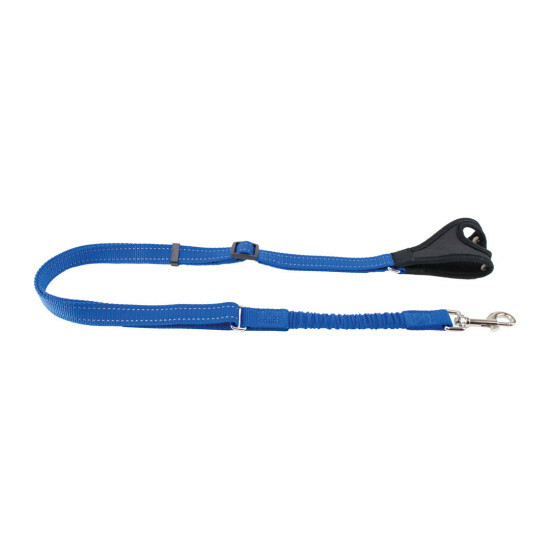 When needed, the Sport Leash’s hand wrap quickly converts to a traditional handle with the snap of a button. The built-in bungee section helps lower leash tension and reduces the impact of sudden pulls or jolts of active pets. The Sport Leash is perfect to use with PetSafe Martingale Collars, Gentle Leader Headcollars, Easy Walk Harnesses and more. An easy to use slide adjuster allows you to adjust the leash length from 3 ft. to 4.5 ft.